FHWA, working with AASHTO and NASEMSO, developed a Motorcoach Roadway Safety Assessment Tool (RSAT) for States and industry professionals to use to identify and evaluate the safety of rural routes that are utilized by motorcoaches. Motorcoach RSAT utilizes inputs from transportation and EMS professionals to measure crash risk along a route, as well as the robustness of communications, EMS response capabilities, and proximity to hospitals and trauma centers. In essence, Motorcoach RSAT is a collection of defined methodologies for processing, analyzing, and mapping data for the assessment of roadway safety for motorcoach travel. The tool provides data visualization, through the Google Earth platform, by rating the selected route for safety as: Blue (Best) to Green, Yellow, Orange, and Red (Worst). 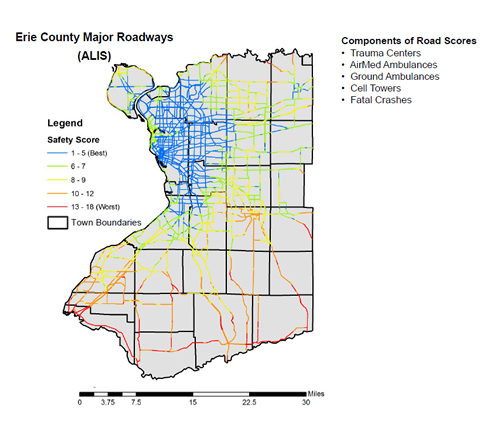 Figure 1 shows overall safety scores, for roads in Erie County, New York. The Motorcoach RSAT processor allows users to selectively browse a number of default data sets as well as process and implement new data layers. Other data sets that a user considers relevant to the assessment of safe motorcoach travel can be imported. In addition to the included data, methodologies to add Point Layers, Create Distance Based Raster Layers, Reclassify Data, Combine and Weight Raster Layers, Extract Point Values, and Convert them to Google Earth Format are provided to allow user created additional safety layers and assessments. Motorcoach RSAT is based on a geographic information system (GIS) platform that utilizes ArcGIS for processing data and Google Earth for visualization. Motorcoach RSAT is distributed in a single compressed (RSAT.zip) file folder containing the data and files to support processing and visualization of the data. A working of knowledge of ArcGIS is necessary to perform additional processing and manipulation of the data, while only a basic understanding of Google Earth is necessary to visualize the data. The details of installing and utilizing the two pieces are described in the user's manual.